10:02 How crucial was MSG to making it into the NA LCS? 14:15 What does esports need MSG for? 27:07 What does success for CLG look like, beyond simply winning? 32:04 Why did CLG leave Counter-Strike? Esports could be bigger than traditional sports one day. It’s an oft-repeated mantra. We hear it time and time again, often couched in some questionable analytics and a lot of optimism. But what is by now an old refrain takes on new life when you hear it from representatives of a multi-billion dollar sports and entertainment company that operates two of the biggest sports franchises in North America and owns some of the United States’ most iconic sporting venues. And that’s exactly the feeling at the Madison Square Garden company, who purchased Counter Logic Gaming in July, according to their head of esports and CLG COO Nick Allen. 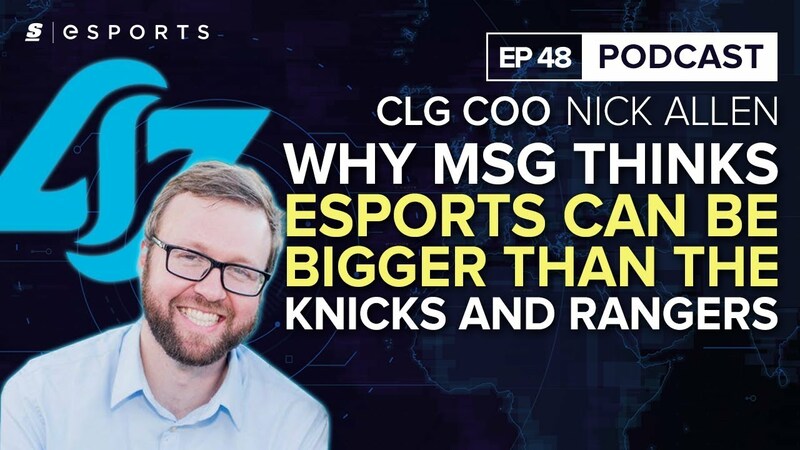 Appearing on theScore esports Podcast, Allen discussed Counter Logic Gaming’s future in the NA LCS, shed light on why CLG (mostly) dropped out of Counter-Strike and explained why MSG sees a long-term future in esports. CLG is among many esports organizations that have partnered with or outright been purchased by non-endemic backers with deep pockets and sports experience in the last year. LCS newcomers Golden Guardians and 100 Thieves have the Golden State Warriors and Cleveland Cavaliers behind them. Team Liquid’s ownership group is helmed by sports and entertainment moguls Peter Guber and Ted Leonsis. FlyQuest is owned by Milwaukee Bucks co-owner Wesley Edens, OpTic Gaming were recently acquired by Texas Rangers co-owner Neil Leibman, and the list goes on. And the wave of non-endemic investment has a snowball effect in esports. “But it’s becoming more and more competitive as there's more and more opportunity around revenue and media rights and merchandising and in some cases ticket sales and other things. So as a result you’re seeing all of these people needing to feel like they need to keep up and infrastructure a way to do that,” he said. The escalation of investment is driven by something remarkably simple, said Allen: The desire to win. Winning means fans, and fans mean revenue. “So much about fan base and so much about identity of teams, growing your brand and therefore growing your revenue as a business, comes from winning. Winning is the paramount goal because that’s a huge way to build fans and through that building revenue for you business,” said Allen. The results from non-endemic investment are already evident in the LCS, he said. “It’s needed because some of the teams are doing it and it’s allowing them to push forward and have these absolutely insane rosters and infrasture -- I think TL’s a good example of that -- and so in order for us to keep up we also need those additional resources’ he said. But the right kind of investment for an esports org is not just about cash, or marquee sports brands, said Allen. He said CLG wanted a partner that was committed to a long-term future in esports. That evaluation is more speculation on esports’ future potential than any kind of prophetic prediction, but Allen said the feeling at Madison Square Garden that esports could be bigger than traditional sports is real. While “winning is out number one goal above all else,” next on the list is brand building. “Higher quality, higher velocity and more interesting content for our fans to consume” is important, Allen said. “Growing our Twitch presence” and “more merchandise that’s interesting and compelling” is another way to reach fans. With the Federal Communication Commission's recent vote to repeal net neutrality laws, the hosts of theScore esports Podcast took the opportunity to ask the former Twitch head of esports about his stance on the subject. If the laws were repealed years ago, the growth of esports could have been badly stunted, said Allen. "It could have literally stifled the entire industry. It could have resulted in no one watching, no one caring, and this industry floundering and not doing anything and not being where it is today." Allen also spoke on CLG’s recent decision to exit male Counter-Strike, recently dropping both their main and Academy rosters while retaining their women’s roster, CLG Red. Allen did not rule out the possibility of re-entering Counter-Strike later down the road, once CLG was better positioned to succeed in that esports.